Firefighters have spent a fourth day tackling three large moorland fires in Lancashire. The fire service said it was one of longest periods of time crews had spent tackling such fires in recent years. About 50 firefighters, on rotation, have been using beaters and spraying water on the flames and smouldering ground at Belmont, Bacup and Ormskirk. The fires have each spread across several square kilometres, the fire service said. At one point over the bank holiday weekend, 32 fire engines from the 39 stations in the county were out on calls. Crews from Merseyside, Greater Manchester and West Yorkshire were also involved in tackling the fires, which were fanned by winds of up to 45 mph. A spokesman for Lancashire Fire and Rescue said the situation was "exceptional" and due to the spell of dry weather, high winds and the fact there were three fires at the same time. He said the crews were mostly damping down the areas, trying to ensure the fires were not still burning below ground and potentially flaring up again. Crews will remain on the moors during daylight but are due to come off at night fall for safety reasons, unless there is a specific risk to property or people, the spokesman said. They are due to return at first light. 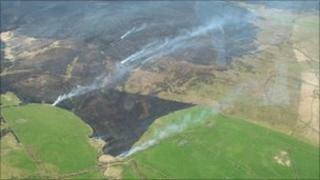 The first fire broke out at Belmont, on both Anglezarke Moor and Wheeton Moor, on Friday morning. On Saturday afternoon, a second moorland fire broke out in peat at Whitemoss Horticulture at Simonswood near Ormskirk. The business supplies peat, compost and horticultural products to gardeners. A third moorland fire was reported on Sunday afternoon at Moor Wind Farm in Stacksteads, near Bacup.